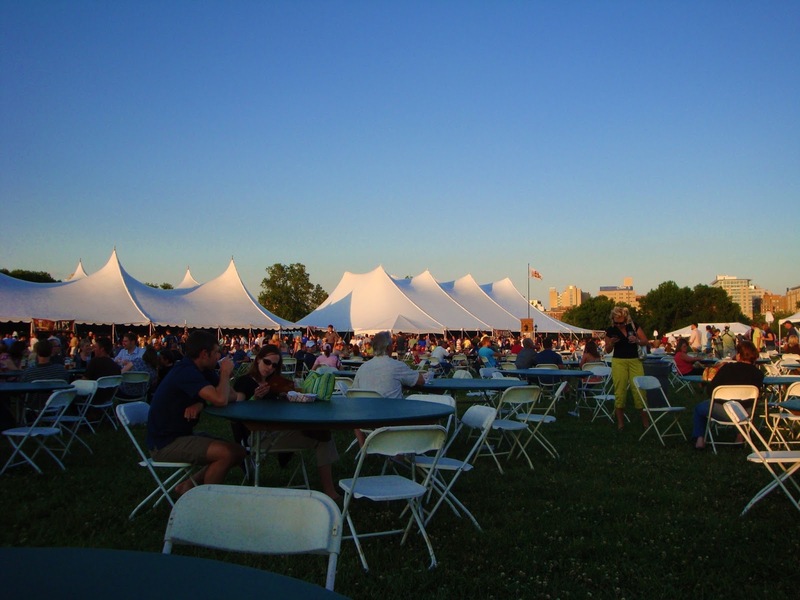 The St. Louis Brewers Heritage Festival is the annual early summer beer festival in St. Louis. This year there were at least 23 St. Louis area breweries and 96 different beers at the event. Admission for one of the four-hour sessions was $40. A few local restaurants/caterers had food for sale at the event. I had a number of different beers, and two that stood out were a walnut oak (very good) and a watermelon (very bad) flavored beers. I went to the Saturday 7-11 pm session, but at about 9 pm severe thunderstorms hit and forced the servers, who were lined up along the west side of the tents to take shelter because of the wind and heavy rain. After the rain stopped (about 30 minutes) serving resumed for perhaps only 10 minutes before the festival was shut down. This was very disappointing because beer was served for only two hours despite the fact that the festival was supposed to go on "rain or shine" and that all the rain had already passed through the area.